While Prince Harry wasn’t physically beside Meghan Markle and Queen Elizabeth II for their first solo outing together in Chester on Thursday, June 14, the Duke of Sussex was certainly there in spirit. Less than a month after the couple’s Windsor wedding, Markle embarked on the royal train with the Queen to travel to the local town, where the ladies bonded during the opening of a bridge and more events. 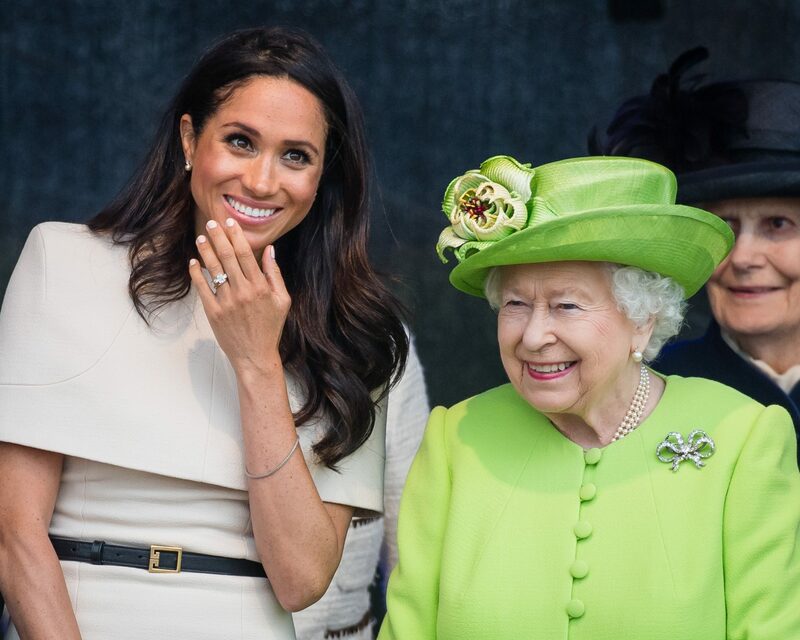 The former Suits actress and her grandmother-in-law multitasked by greeting well-wishers, including one lucky woman who asked Markle about her newlywed life with Harry. “It is wonderful,” Markle told Sharon Briscoe (according to People). “I’m really enjoying it.” That wasn’t the extent of their interaction. “I said to give our love to Harry and to look after him,” Briscoe later recalled, to which Markle had an incredibly gracious response. For the outing, Markle chose a shoulder-covering dress by her wedding dress designer Givenchy, which she paired with black accessories and of course her wedding band and ring, elegantly stacked on her finger. The Queen adorably gave Markle a pair of her own pearl earrings to wear for the appearance. Harry and Meghan married at Windsor on May 19. Since then, they’ve been rather busy, enjoying a two week honeymoon, along with an appearance at Prince Charles’ birthday party and the Trooping of Colour with the rest of the family over the weekend. Watch the video above for more details on how Markle paid tribute to the late Princess Diana on her wedding day, and secure your ideal wedding vision by starting with The Knot’s Style Quiz, here. Be the first to comment on "Meghan Markle Just Called Prince Harry the “Best Husband Ever”"